Rediff.com » News » Arab world on fire: Will JK witness copycat protests? Arab world on fire: Will JK witness copycat protests? The prairie fire of mass protests in Tunisia continues to burn and shows signs of spreading to Libya, Algeria, Egypt, Jordan and Yemen. In Tunisia, protesters want the entire old leadership to be removed, arrested and prosecuted lock, stock and barrel and their illegally-acquired wealth parked in secret bank accounts abroad to be brought back. Saudi Arabia, which has been giving shelter to the discredited despots of the Arab world, has not yet been affected, but it cannot remain unaffected for long. Egypt saw massive protests on January 25 in response to tweeted calls from nowhere and everywhere for observing a 'Day of Revolt'. Tweets are now calling for a 'Day of Anger' as a follow-up on January 28. Libya, Algeria, Jordan and Yemen are seeing the beginnings of a protest movement. Whether the prairie fire continues to spread or subsides would depend on what happens in the coming days in Tunisia and Egypt. The developing situation is very confusing. 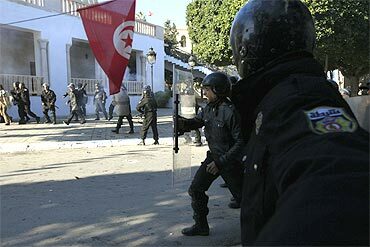 In Tunisia, the army initially fraternised with the protesters and reportedly refused to act against them. Latest reports say it is concerned over the continuing protests over one issue or the other and might be tempted to intervene and take over power to restore law and order. 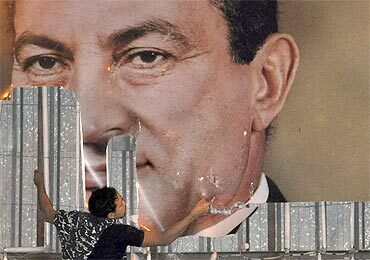 In Egypt, the army is still carrying out the orders of President Hosni Mubarak, but for how long it will do so remains the question. Will it mark the beginning of the end of political Islam? 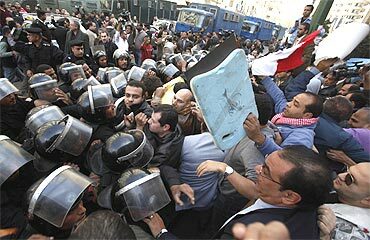 New faces and new voices are emerging across the Arab world to take over leadership of the protesters. 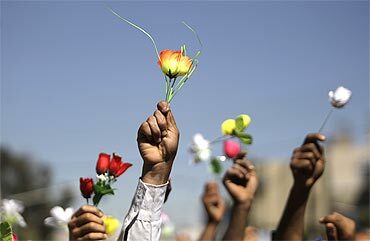 Political and economic causes are behind the protests -- despotism, suppression of the rights of the people, excesses of security forces in dealing with people's movements, unemployment, inflation, corruption, opulence of leaders etc. One does not know in which direction -- towards democratisation and religious liberalisation of Arab world or towards more radical Islamic doctrines -- these new faces and new voices will take their countries forward. Will it mark the beginning of the end of political Islam or will it see a new phase of it? The protesters are not inspired by the Al Qaeda or other jihadi organisations, but some traditional Islamic organisations such as the Muslim Brotherhood of Egypt are taking advantage of the bandwagon effect. The West -- particularly the US -- which hailed the East European revolt of the late 1980s and the early 1990s, is concerned because in many places the protesters are targeting Western surrogates in the leaderships of these countries. The Eastern Europe revolt was beneficial to the West. The Arab revolt, if it succeeds, may not be so. What impact will it have in Af-Pak region? Its political and economic fall-out is unpredictable. What effect will it have on the availability of energy to keep the economies of the world going? What effect will it have on the ideological campaign against Islamic radicalisation? What effect will it have on the so-called war against terrorism? What impact will it have in Af-Pak region and Iraq? United States officials are travelling across the countries on fire, advising the leaders and the security forces to observe restraint while dealing with protesters. The World Economic Forum in Davos, which is holding its annual meeting since January 26, has been fiddling while the Arab world is burning. 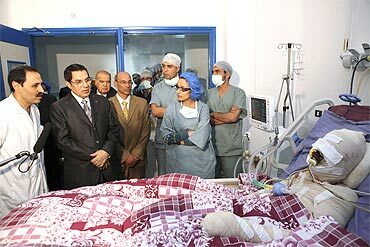 It has created a last-minute panel to discuss Tunisia. Do the protests call for a re-visit of the economic model propagated in the past by the WEF? Many of the business tycoons -- particularly from Europe -- who have assembled in Davos, are the very same people responsible for the economic plight of Arab protesters. Yet, the sound of silence from Davos is deafening. An obliging Swiss government has seen to it that there are no inconvenient protests against the WEF in the streets of Davos and Zurich. India should carefully monitor the protest waves in the Arab world. The protest waves in Eastern Europe had a copycat effect in Jammu & Kashmir. The protest waves in the Arab world too could have a copycat effect. We should not be complacent under the illusion that this can't happen in J&K. It can -- if we do not address the anger of the people to the extent possible and if our security forces do not exercise restraint in dealing with protesters. People-friendly policies are the urgent need of the hour.